Good morning stampers! Did you miss me yesterday? I was having a great time stamping with my friends at two stamp camps. You really need to come join us at camp sometime if you've not been over. We always have the best time together - don't we girls?! Check out my class/camp schedule at my website - www.robinstamps4u.stampinup.net It's posted under the Events Page. I even have my August Classes posted! Anyway, just a quick post today to show off one of the cards we all made yesterday. It's created with that fabtastic new Medallion stamp! Such a gorgeous stamp - everyone loved it and I can assure you that it will get a lot of use in the studio! Everything about this card is pretty simple, so I'll leave out construction details, but the supply list is at the bottom of this post so you know what to shop for on my website if you want to recreate this beauty on your own! I did use my Bone folder to curve the greeting and it's attached with Mini Glue Dots. That's the only 'different' element to this one. Simple and easy, but elegant as well. Love cards like that! 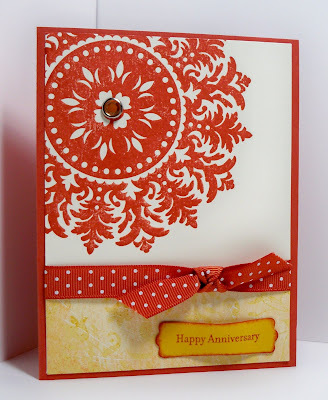 Have a wonderful Wednesday my stamping friends! See you back here tomorrow! Be sure and leave a comment today to let me know you stopped by - I love to hear from you! Shop 24/7 from my Stampin' Up! Website - www.robinstamps4u.stampinup.net Just click on the SHOP NOW button at the upper right corner of the Main Page! Yummy card! the medallion is up there with the Baroque Motifs among my favorite stamps. Beautiful card Robin. I love the way you inked around the the punch! Such a neat way to make the greeting stand out without matting. Blessings!